Delaware's Brandywine Zoo recently transfer an Amur tiger named Zhanna to the Wildlife Conservation Society’s Bronx Zoo in New York. The Wilmington zoo made the transfer in accordance with the Association of Zoos and Aquarium’s (AZA) Species Survival Plan. The AZA’s plan works to manage captive species' breeding to ensure genetic diversity. Amur tigers, native to eastern Russia and northeastern China, are endangered, with just 500 individuals living in small populations in the wild. 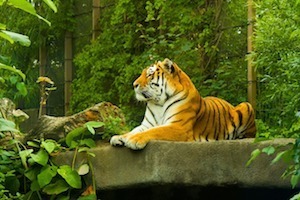 Zhanna, born in the St. Louis Zoo, has an ideal genetic profile and age for breeding, and the Bronx Zoo is internationally renowned for its tiger-breeding program, as well as boasting an open range exhibit and state-of-the-art off-exhibit areas.